Content in this area changes from time to time. If you have visited this page before you will need to use your browser's Reload Button to see new content. Updated the Equipment Page which goes into detail about the equipment we use and is a source for all the user manuals. Saturday, April 20, 2019 Tom plays with the Common Thread Band at the Journey Bible Fellowship Church for their Eggcellent Adventure from 3:00pm to 4:30pm. Saturday, May 11, 2019 Hutto Spring-A-Palooza. 110 East Street, Hutto, TX (downtown). This is the second annual event featuring live music, demonstrations, a kids play area, food trucks, and craft vendors. The event runs from 9:00 am to 4:00 pm. Tomzap plays 11:00 am - 12:15 pm and 2:00 pm - 3:30 pm. Sunday, May 19, 2019 Deutschen Pfest in Pfluger Park, Pflugerville, TX. 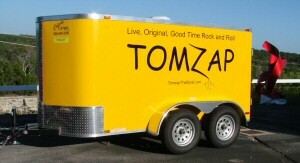 Tomzap plays on the Hillside Stage from 1pm to 3pm. Saturday, July 6, 2019 6pm - 8pm. Trailblazer Grille, 216 S. Main St., Burnet, TX. Saturday, August 31, 2019 11:33am - 1:33pm. Oatmeal Festival. Wheeler Park at S. Gabriel St., and E. Vaughan St., Bertram, TX. Tomzap plays for the Oatmeal Festival following the Run For Your Oats 3.3-mile race event. 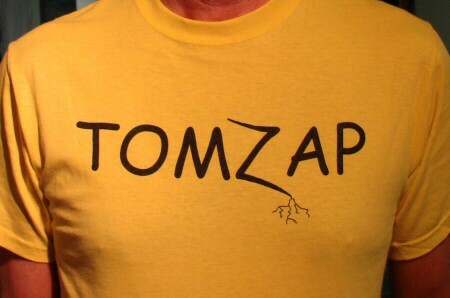 If you would like to be notified of events by email, send a request to tom@tomzap.com. For information on previous events, see Past Dates. Here are some of the recent performances. For more details with live recordings, photos, and videos, see Past Dates. Saturday, March 30, 2019 11:00 am to 2:00 pm. Tom and Brian played with the Common Thread Band at a carnival at Pleasant Hill Elementary School in Leander. Friday, March 29, 2019 6:00 to 8:00 pm. Private event at The Hollows Beach Club, Jonestown, TX. Friday, February 8, 2019 Downtown Hall of Fame, 205 East Street, Hutto, TX. 8:30 pm to 11:30 pm. www.thedowntownhalloffame.com. Friday, January 18, 2019 Downtown Hall of Fame, 205 East Street, Hutto, TX. 8:30 pm to 11:30 pm. www.thedowntownhalloffame.com. Sunday, January 20, 2019 Round Rock Car Show. Hosted by the Round Rock Police Officers Association and the City of Round Rock, at Centennial Plaza, 301 W Bagdad, Round Rock. 10am to 1pm. Saturday, November 10, 2018 Leander Veterans Festival at Veterans Park, 1011 S. Bagdad Rd., Leander, TX. The event features Live Entertainment, Veteran's Tribute Ceremony, Car Show, Military Static Display, Vendors, Food Trucks, Children's activities, and much more. Started with a ceremony at 2:00 pm and Tomzap played from 3:30 pm to 5:30 pm followed by Departure ATX from 6:00 to 8:00 pm. Saturday, October 20, 2018 Bill's Burgers, Marble Falls location. 307 Main St., Marble Falls, TX. 6:30pm to 8:30pm. Sunday, September 30, 2018 Tom, Brian, and Shane played with the Common Thread Band at the Hot Rods and Harleys Event at the Journey Bible Fellowship Church at 3429 Journey Pkwy, Leander. Saturday, September 15, 2018 Event Cancelled Leander Old Town Summer Nights. 205 W. South St., Leander, TX. Tomzap plays on the Old Town Grandstand from 6:00 to 9:00 pm. The event features vendors, a farmers market, dining, car show hosted by the City of Leander and the Leander Chamber of Commerce and Visitors' Center. Admission is free. Sunday, September 2, 2018 Tom, Brian, and Shane played with the Common Thread Band from 5:30 to 8:30 pm at the Cedar Park Splash Jam in Milburn Park, 1901 Sun Chase Blvd. at Cypress Creek Road, Cedar Park. We sometimes add Brian Chase on keyboards and vocals. Tomzap plays�family-friendly good time rock and roll.� The playlist includes an eclectic mix of original and cover songs including classics from the 60s, 70s, 80s, 90s, as well as some more obscure songs, 3 Spanish-language songs from the Argentinean band, Soda Stereo, and songs from movie and TV soundtracks.� We are based in Oatmeal, TX, and we have played for the Leander Car Show, Leander Popup Festival, Round Rock Police Car Show, Georgetown Red Poppy Festival, Georgetown Music on the Square Summer Concert Series, Wimberley Armed Forces Day, first annual Hutto Spring-A-Palooza, Pflugerville Deutschen Pfest, Stephanie Meyers Pflugerville Classic Car Show, Leander Beer Market, The Hollows Beach Club, Riata Apartment Community, Bryson Community, and Roots Bistro in Georgetown.� The name Tomzap is borrowed from another active project, The Pacific Coast of Mexico. In the song list below, you will find "play" links to listen to most of the songs. "About" links take you to lyrics and descriptions. More live recordings and videos are available on the Past Dates page. Contact us by email: tom@tomzap.com and find us on ReverbNation, and Facebook as well. Contact us by email: tom@tomzap.com. We would love to play at your party or venue and will do so at a price you can afford. We do not use instrument amplifiers and we use electronic drums so we are capable of playing at either very low or high volumes, and we are only 3 or 4 people so we don't need much room. T-Shirts: We have T-shirts in sizes from S to 3XL, This is a quality T-shirt, 100% cotton, heavy. US$10. Shipping is included in the continental U.S. US$12 if shipped to Canada. Insulated Mugs: We got a supply of these because this style is getting hard to find. This is a quality 20 oz. insulated mug made in the U.S.A., in Texas. This is the cup that Tom likes because it has a nice, wide base that doesn't tip over while your rockin'. It will also accept a drink can. 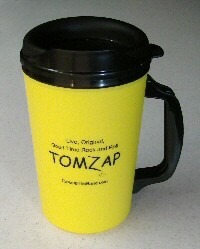 Tomzap insulated mugs are available at live performances for $5. Recordings of the songs come from our practice sessions and live performances. Click on "play" to hear a recording. Click on "about" for lyrics and descriptions. For live recordings, see Past Dates. Here are some videos from practices and live performances. Bill's Burgers in Burnet, TX, on 6/23/2018. at the Orchard Ridge Amenity Center on 6/9/2018. Everlong played by Tomzap at Bill's Burgers in Marble Falls, TX, on 5/26/2018. in Jonestown, TX, on 5/25/2018. programmed drum tracks on 5/25/2018. Radar Love played by Tomzap at the Pflugerville Deutschen Pfest on 5/19/2018. Starlight played by Tomzap at the April 15, 2018, Round Rock Car Show in Round Rock, TX. Starlight played by Tomzap at the Roots Bistro in Georgetown, TX, 1/26/2018. Heatwave played by Tomzap at the Roots Bistro in Georgetown, TX, 1/26/2018. Talk played by Tomzap at the Leander Beer Market Arts & Ales Festival 11/17/2017. Rebel Yell performed by Tomzap for the Veterans Day Festival on 11/11/2017. That's What She Said performed by Tomzap for the Veterans Day Festival on 11/11/2017. Club in Jonestown on 8/19/2017. the guests of The Hollows Beach Club in Jonestown on 8/19/2017. Hollows Beach Club in Jonestown on 8/19/2017. Pflugerville on June 30, 2017. Cruise-In at Freddy's Steakburgers in Pflugerville on June 30, 2017. Concert Series on June 23, 2017.
at Tower Park in Leander on June 15, 2017.
in Leander on June 15, 2017.
celebration in May of 2017.
private AFD celebration in May of 2017. Rebel Yell by Billy Idol, performed by Tomzap at the Liberty Hill Beer Market on April 28, 2017. Devil Dog Squadron party at Pilot's Choice Aviation in Georgetown, TX. See more. at Pilot's Choice Aviation in Georgetown, TX. See more. Tomzap playing Science Fiction Double Feature at the Leander Beer Market on 10/13/2016. This was our first performance with bass player, Mario Marrufo. first performance with bass player, Mario Marrufo. Leander, TX, on April 9, 2016. Tomzap playing De Música Ligera at the Leander Beer Market on May 6, 2016. Tomzap playing Talk by Coldplay at the Gold Coat Inn on 6/6/2015. and Whit Pennock. The song is Venus, originally played by Shocking Blue. Heat Wave, written by Holland-Dozier. We have several ringtones from Tomzap recordings that can be downloaded for your cellphone. To load a ringtone into your iPhone, drag the ringtone file into the location in iTunes on your computer where the other ringtones are stored. Then sync your phone to iTunes. This page has been visited times since May 2012.